Joining forces for their first exhibition at Moberg Gallery are the alternately sonorous and quiet orientative works of Des Moines artists Sarah Grant and Scott Charles Ross. 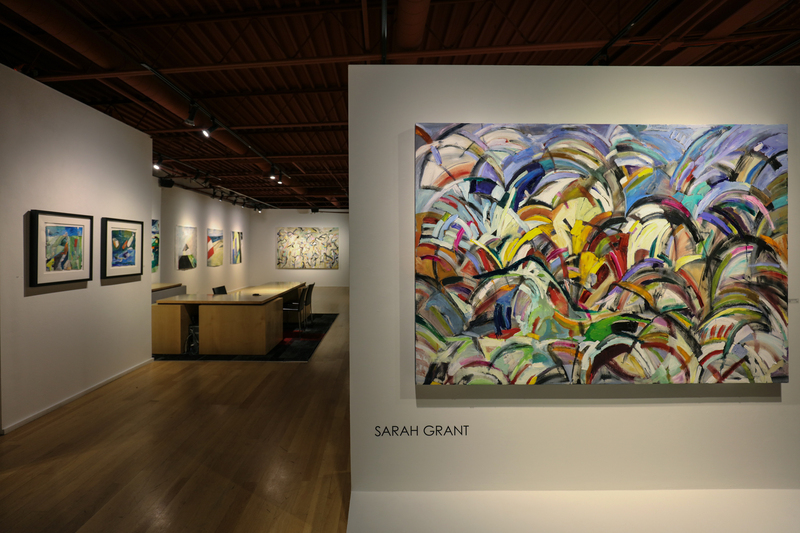 Sarah Grant’s new works are hewn to certain forms and colors of her earlier paintings, yet burgeon with new vigor and concept, focusing more on place and how place might inform ideas. Grant’s abstracted landscape, “Loess Hills,” is an intricate color stratum, complete with the verticality of complex and integrated elements. The bluffs and ridges here are rendered in captivating browns and greens, and the sky is predominantly yellow, with patches of all that’s reflected below, inclusive of small blue moments. The wind that created these prairie and forest ecologies are present on the canvas, as well, in the sweeping strokes that indicate movement, and speak to the history of the evolutionary landform of this stunning region in western Iowa. “The Clamor and Quiet of Change” is a foray into a different kind of landscape, one more personal, cultural, societal, political, in that all of these things are inherent and create the atmosphere in which we are steeped each day. Grant’s color chorus here, in short brush strokes, creates a sea of half moons, which present as active but also mimic the musical fermata, over and over again—such as with breath, which relies upon resting for continuance. The maximal curvature here makes for a resplendence that in its substantive extent becomes a visual overture. This can be read as hope, given that change is both processual and resultant. That the eye keeps moving over the painting, but is drawn to land almost at center on a few golden nuggets of space offers a meditative opportunity of the impermanence of things and the very permanence of change itself, though it can be seen shining at the eye of the world’s continuous storm. “Texas Road Trip,” a large oil on paper work, reminds us that with her art, Grant is taking us on a journey with her. This painting’s perspective is a wonderful blend of frontal, for the horizon; and aerial, for a fuller expanse. The vibrancy of the palette here, and largeness of a Texas landscape, is here transformed into largesse of the Earth’s subsystems: land, water, air, and the livingness of what grows because of them. Grant’s other oil on paper works are more subdued and minimal. “Italy 1” depicts the beach at its very shore, where the dark water hits the light “dry” grains of sand. 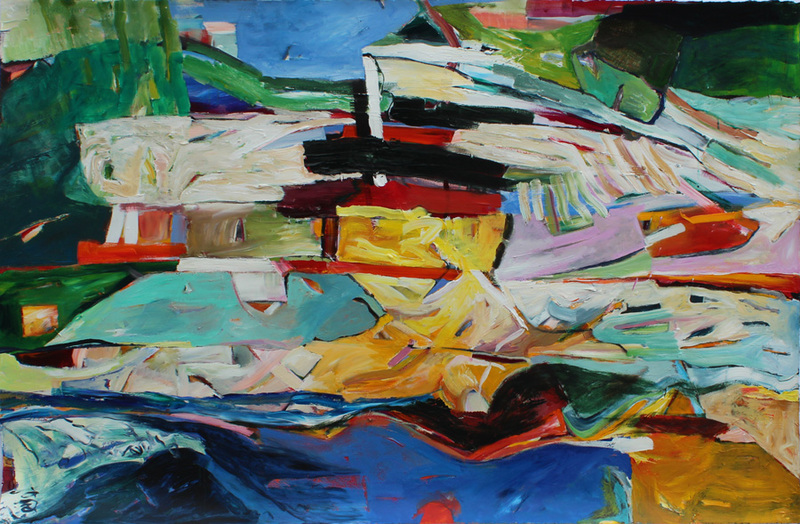 An umbrella, or bit of a beach hut, works its way into the left side of the paper, and the subject and composition is reinforced by the nautical colors. “Italy 2” is architectural in its study of line, angle, and dimension, but is loyal to Grant’s recognition of and use of yellow, which is her particular solar warmth, and which suffuses her work and embraces the viewer. The focus on corners and plinth-like shapes joists the work, offering an up-close solidity that feels like a representational building of which the viewer is entering. In “Italy 3,” Grant employs the pyramidal shape, almost as a puzzle, resulting in a simple house on hill. There is whitewashing, which makes for a perfect clouding of the sky, but there is a light lemon yellow which bathes a portion of the composition in a diffuse mist of what feels impressionistic. Below the house, however, are harder edges, black shadow and bright green grass, thus making a clear divide between lower and upper, though at each edge, the boundaries do not so much blur as complicate division. “Cave Painting” is a fantastic foray into Grant’s Abstract Expressionistic influences. 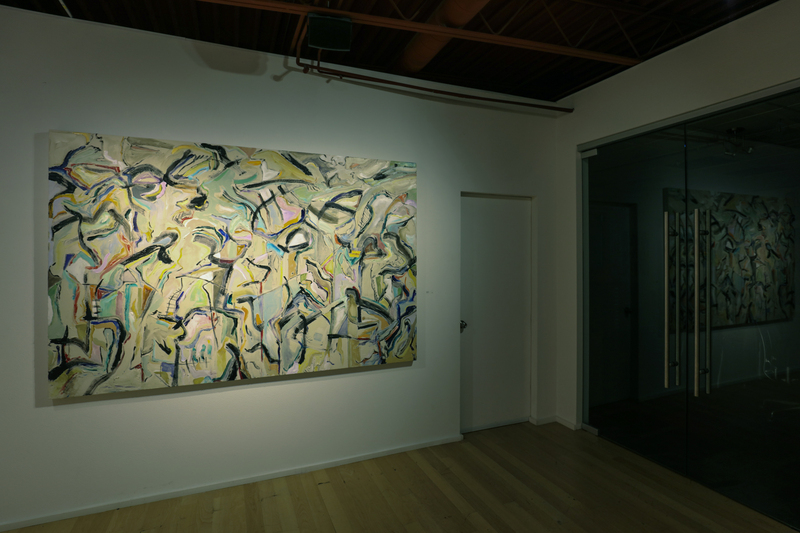 A wonderful large-scale work that operates as a wall section of an imagined cave, this oil painting is reminiscent of the Lascaux paintings from twenty thousand years ago and also of mid-century modern artworks, such as those of Jackson Pollock and Willem de Kooning. The black lines appear to intimate animals, and pale colors with vibrant highlights conjure contemporary versions of the centuries-old earth pigments of the parietal artworks. This work tells a story of abstraction itself, while remaining referential of and reverential to history and prehistory. Many of the earliest cave paintings were found in France, and ochre was an abundant clay earth pigment locally sourced for these. One of the areas known for its deposits of ochre is the village of Roussillon, in the southeastern region of France. 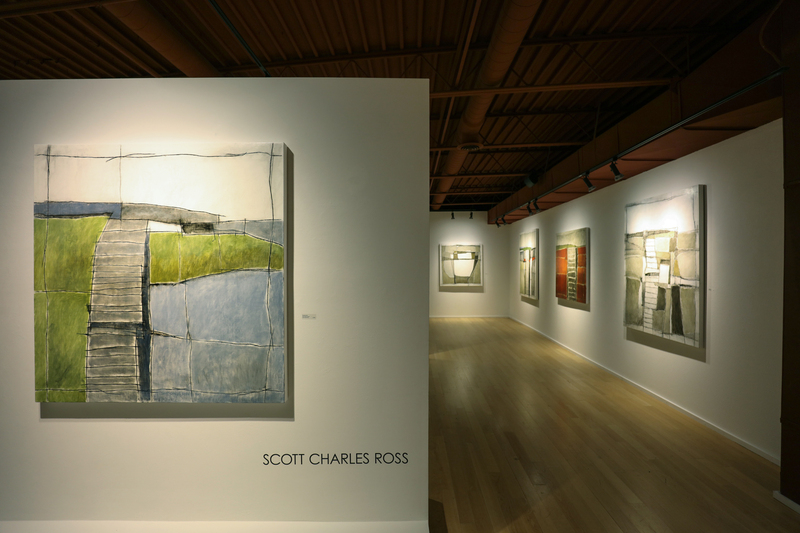 It is a place that is invoked and evoked in the contemplative paintings of Scott Charles Ross. Ross’ calm and calming paintings have an unusually glossy sheen, due to his method of painting and process of preparing the surface of his works. 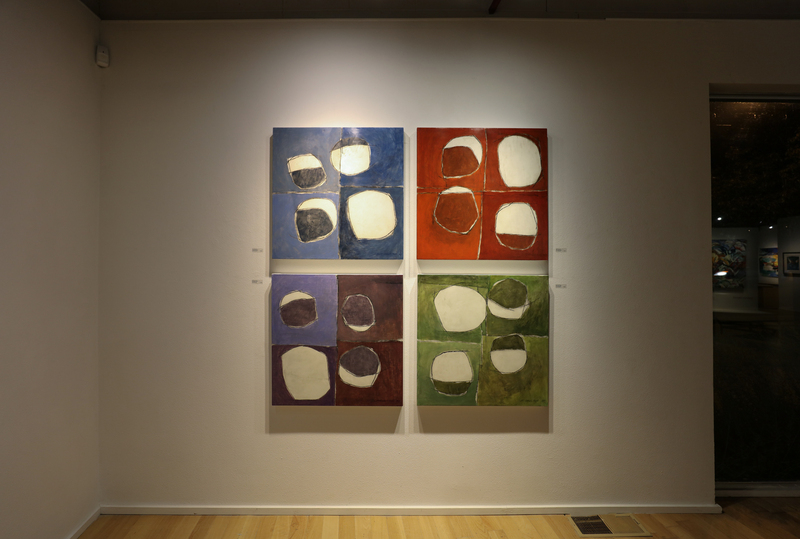 This body of work is on linen over panel, and the solid underlying structure—coupled with the layering of charcoal, oil paint, wax, and glaze—brings forth a taughtness, also, that presents more as a three-dimensional object than a two-dimensional plane. In Ross’ words, he is “merging concrete visual elements with inner observations, and [he] intend[s] to transfer abstractions into a perceived reality for the viewer.” What an apt way to manifest interiority: with the phasic and cyclical movements of the moon, as well as by abstracting possible geographies that hold exploitable gifts which must be preserved. 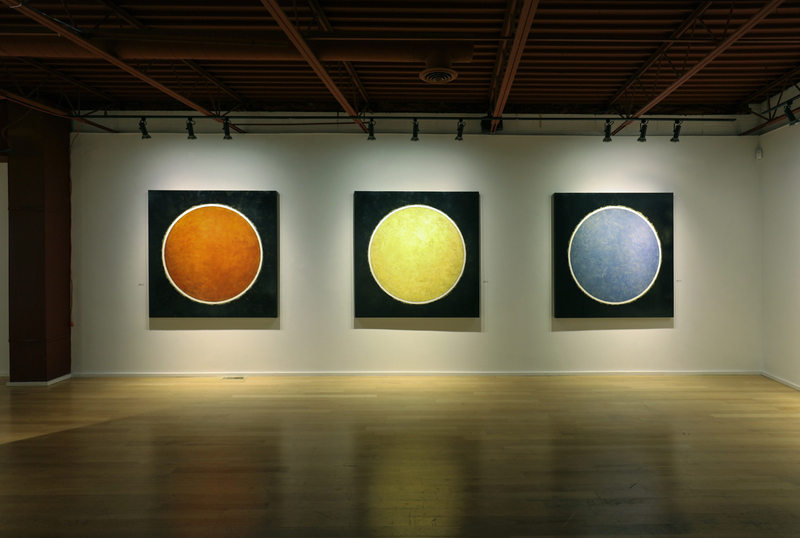 “Blood Eclipse,” “Harvest Eclipse,” and “Blue Eclipse” are spare geometric paintings of large colored circles, girded in white outlines on all-black backgrounds. The white is a semblance of the halation an eclipse causes. 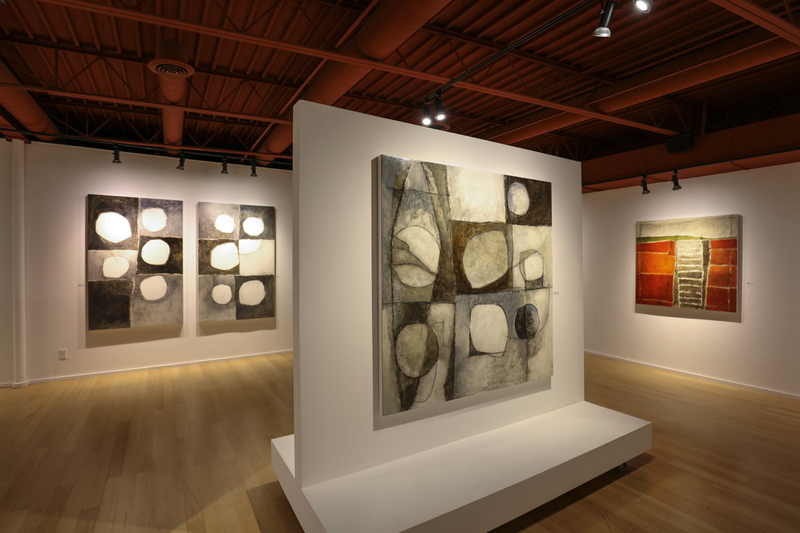 These are stark and poignant works that capture the sensation of witnessing light as it is obscured, as well as creating texture of the large substantiated circles, indicating topographies. The landscape in “Roussillon” is punctured with whites and reds, and small patches of bright yellow paint are employed vertically to create a sense of vertiginous cliffs: looking out, over and down. This prepositional placement of the viewer in front of the painting is integral to the larger maps of paths, sectioning as they do to create more places within a landscape. The areas of color and shape create a subtle and impressive perspectival confounder. Ross’ “Roussillon Storm” reconfigures the land of which it speaks, and creates color-space that gives off an impression that its boldest face is when the sun is upon it, and here holds blocks of deeper color, such as orange and red and green. The ochre for which the titular village is known starts to emanate, and one can imagine ley lines crossing these very distinct painted lines, shifting the sight path of this place and honoring internal directions, as well. “Roussillon Stone,” beautiful in its template-like nature, appears to literally lay the groundwork for this series. In its soft earth tones, it evinces the gray and dusty browns of the rock of the region. And “Rousillon Blue” mutes the green, infiltrating with grays. There is a more apparent and rigid grid here, though the elements of the piece work off grid more than on. 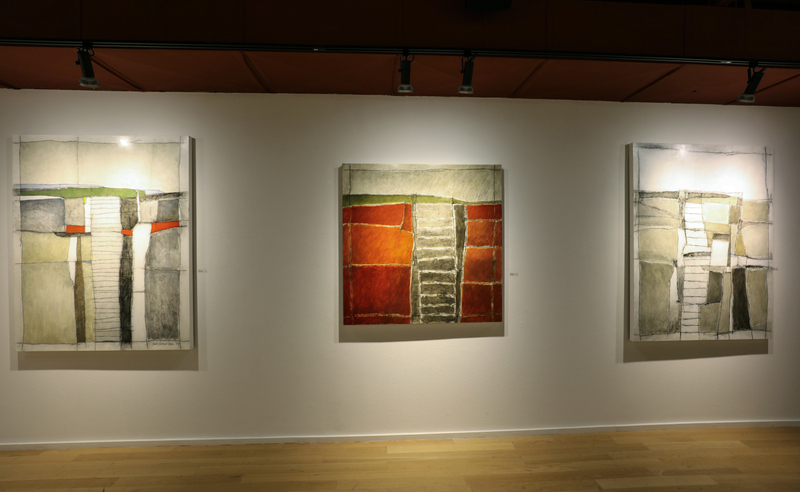 This piece gives a frame for the line work and play that creates land formation shifts, along with the stairwell-like components, which the viewer mentally climbs up and down in each work in this series. The “Moon Phase” paintings are chart-like in their repetition, though each one is different either in number and color, or both, and the rendering of individual “moons.” For repetition is not and does not intimate sameness, and none of these pieces are the same, though they are of a certain iterative theme: of location and its relativity to other forces. Gravitational pull is not the only force we deal with on the planet, of course, and these paintings may serve to palliate for moments in our particular individual and communal spheres. These works offer a pause, a caesuric measuring of time as we await a world that might meet us at or from a different point of view—a new perspective—where a shift will have taken place, or at least will have augmented our place in time. 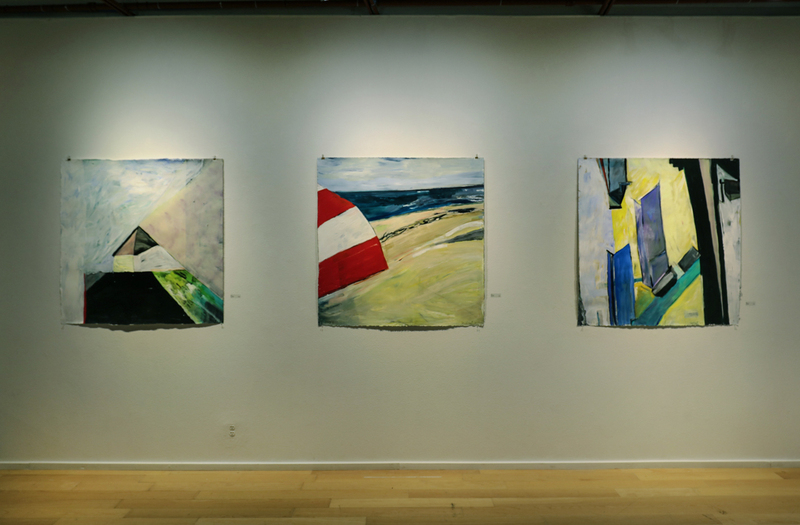 Stop in to view these re-locational works as a prelude to the holiday season. The exhibit shows through Saturday, November 25.